Let me start from the beginning. On Saturday I had a session in Frederick, Maryland a little over an hour and a half away. Because Adam now works on Saturdays, my Mom agreed to watch the kids and asked that I pack their winter clothes because they would probably go sledding. I dropped everything off and made my way up to my session, like hundreds of times before. So, during sessions, I rarely keep my phone on me. Per usual, I kept my phone tucked in my camera bag in my friend's living room while we worked in the bedroom. I didn't check my phone until the end of the session and thought it was unusual that I had two missed calls and two voice mails from my Mom. Now, I've already given my Mom a hard time about how horrible her message was. Not only was she heinously vague, but her tone had me concerned whether or not Brody was even alive. The agony of finally getting a hold of her and understanding what had happened were probably the scariest 30 seconds of my life. "Kelli, it's me. I think Brody has hurt himself outside. You need to come home as fast as you can." Once I finally reach my Mom, I breathed a sigh of relief. Brody had been sledding and she thought he must have hurt his ankle or something, because after he stopped, he couldn't get up and refused to put weight on his leg. Something about the way he cried when he stopped sledding, and she felt like he was acting just like my nephew Jordan did when he simply rolled off her couch and broke his arm. I didn't get too many details in that initial phone call but I packed up my gear and headed home. On the way, I called the resident Orthopedic Specialist in the family, my brother's wife Karen. Her kids have broken more bones than we can remember. She gave me a few tips and things to look out for and I called my Mom to get more information as well, and brought Adam up to speed. I also texted my friend whose husband is an EMT, to see if he could possibly head over and give Brody a once over. She didn't get my text until I was just about home, so I told her not to worry too much about it. He will come back into the picture later. When I walked into my Mom's, Brody was on the couch with my sister Jodi, wrapped in a blanket. When he saw me, his face just crumbled and he started to cry. The question was then how to get him to the Emergency Room. 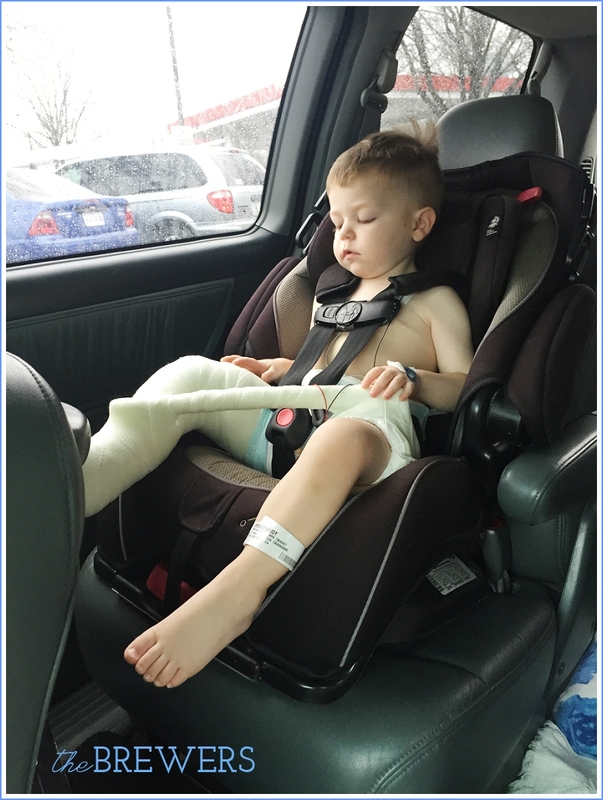 Obviously if something was wrong with his leg, it couldn't be dangling in a car seat. 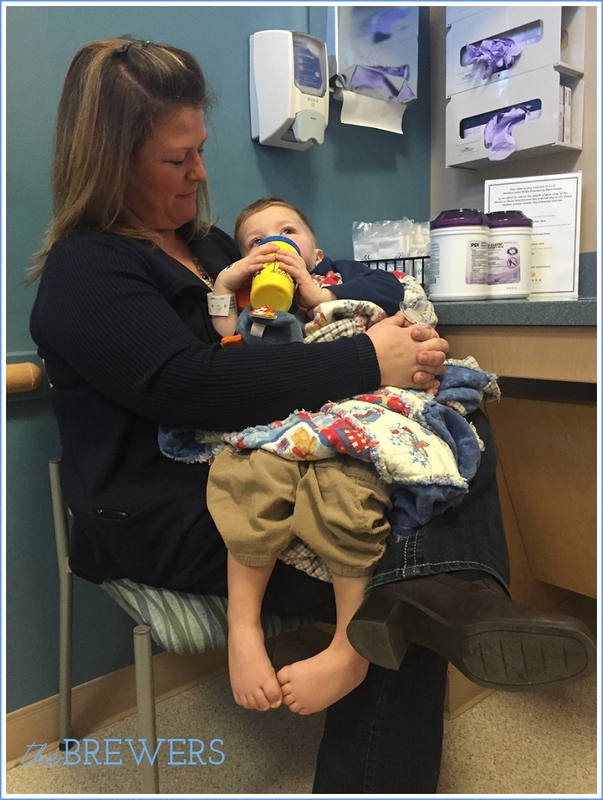 Luckily, Jodi was free to come with me to the ER and hold Brody in the backseat. Unless you moved or touched Brody's leg, he was actually fine. Aunt Jodi had him smiling and laughing in the backseat! 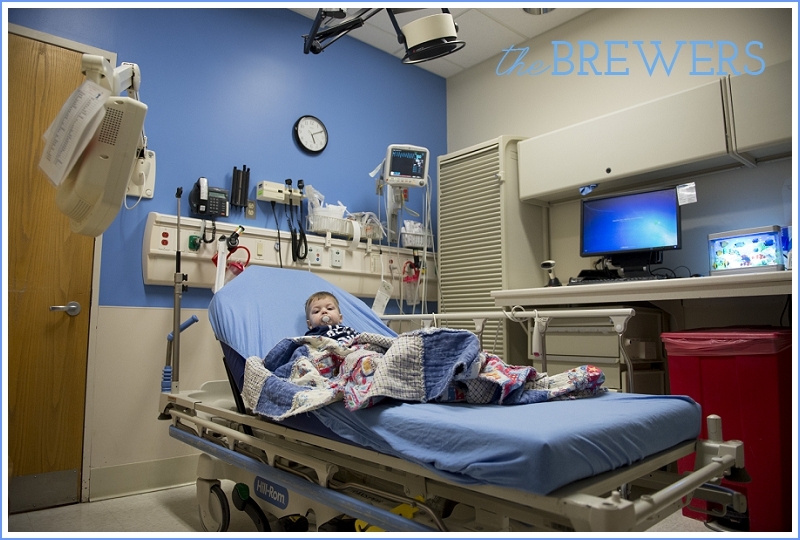 When we arrived to the ER, we were almost immediately taken back once I checked in. At first the nurse asked us to get his weight by standing him on the scale and Jodi and I both looked at each other like, "Are you serious?" So we skipped that an instead went and waited for the doctor. They did an initial once over of him, feeling for broken bones or anything obvious. The doctor then sent us back for X-rays just right around the corner. Brody was such a good sport during this whole process. It wasn't until he was lying on the Xray table, crying as they were fiddling with the positioning of his leg and he's reaching out for me, "Hold you! Hold you!" that I wanted to cry. I held it together, shedding just a tear or two and trying to keep a smile on my face for my brave little boy. After the first round of x-rays came back clean, because he was so upset when his leg was bent, she sent us back for a second set to get above the knee. After they did the second bit of x-rays, the radiology tech suggested I carry him differently, which to me was a big red flag they found what was wrong. When the doctor came into the room, she had this sad face and told us that he had broken his femur (the biggest bone in your body, so I've heard). So much for my mom's medical degree - she thought it was for sure in his ankle or the lower part of his leg! After apologizing for having to ask, she did make sure that we believed my mom's story as to how the break occurred. My sister and I both just laughed, assuring the doctor we trusted that while it probably wasn't her best judgement to let him go sledding by himself where she did, it was a complete accident. I don't trust anybody more than their Nana! 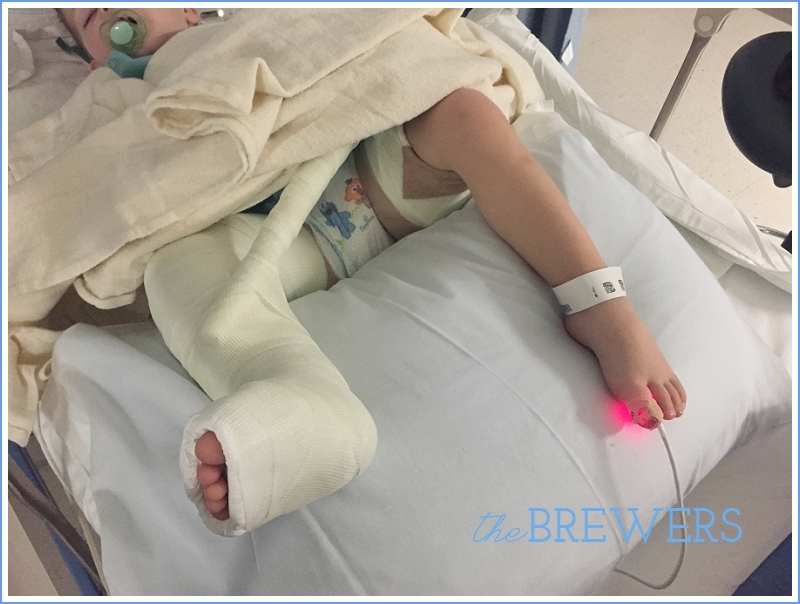 So once we had the diagnosis, the doctor said that she was in touch with the pediatric orthopedist at Inova Fairfax, which then brought up the reality that we would have to be transported to Inova Fairfax... in an ambulance. Say what?! I was actually pretty excited about that - never been in one of those! 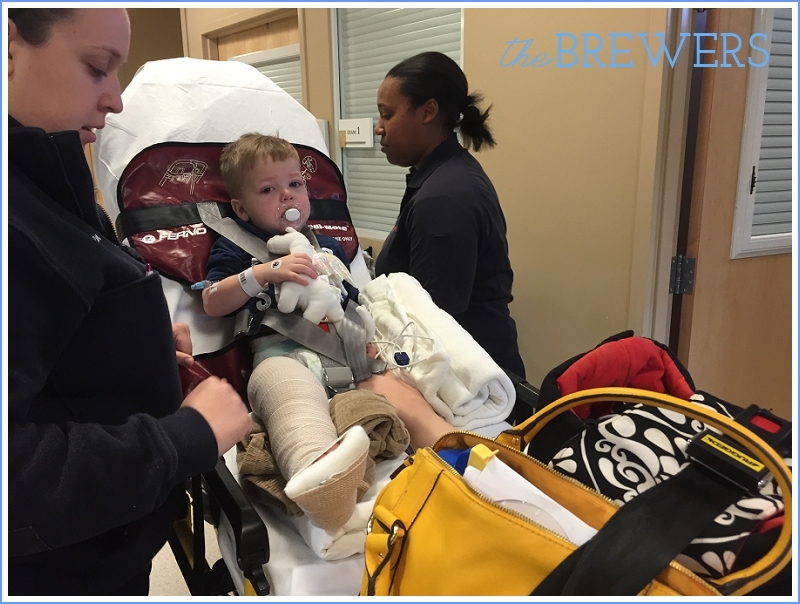 After we got the okay and clearance to head up to Inova Fairfax, the ER doctor told us what the possible plan was for Brody's leg, and that included surgery. I just laughed in shock and did a literal face palm. I didn't even think that was a possibility! I thought they would just cast up his leg and we'd be on our way. Oh well! At that point the ER doctor laughed and said I was handling this the best she's ever seen after having told a parent their child would need surgery. I held my arm up in victory and just laughed. I mean, what else can you do? From there, it became kind of a zoo. The hospital in Fairfax wanted another x-ray from a different angle, but this time they brought the machine to Brody. From there he had to have the leg stabilized (which they had to do twice because the first time was not adequate) and he was given an IV (and effectively had to be held down to do so), I had to collect all my things for a possible surgery and night at a hospital, email my counselors at church that I probably wouldn't be there, etc. Poor guy did not like getting his leg splinted or his IV. Despite getting a shot of Morphine before we left, Brody was all enamored with the ambulance. Both of these ladies were so sweet and wonderful. I was able to send Jodi home with my car and ride with Brody in the ambulance up to Fairfax. I'd updated Adam on the situation and he was leaving work to meet us at the hospital. We had a short ride in the ambulance where Brody was in awe of the cars following us and every bump we hit, and I talked to the EMT all about her job. Luckily through all this, I was too fascinated and in probably some short of shock to realize how serious the whole situation was. 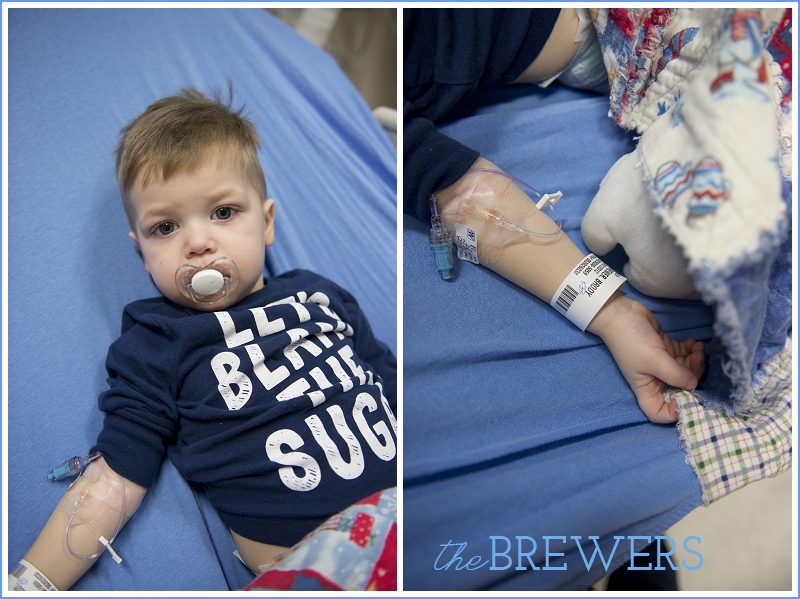 We were transferred to the pediatric ER and got all checked in and waited for an update of what would happen next. Shortly after we arrived, one of the nurses in the ER brought Brody a cute little pelican-like Beanie Baby for him to hold and be distracted with. Apparently someone donates these to the ER, which I thought was awesome. 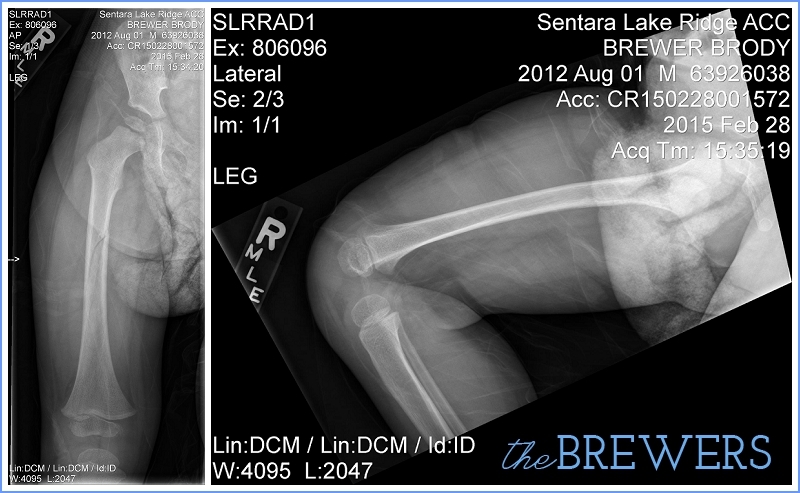 Despite having what we would later come to find was a broken femur, Brody was incredibly polite and sweet to everyone. If he was handed something he would say thank you, if I said we were "all done" he would confirm by asking, "All done?" and even cracked a few smiles and laughs to the ladies when they weren't poking and prodding at him. My sister later told my mom how impressed she was by how well I held it together. Even she was having a hard time watching Brody get the IV. 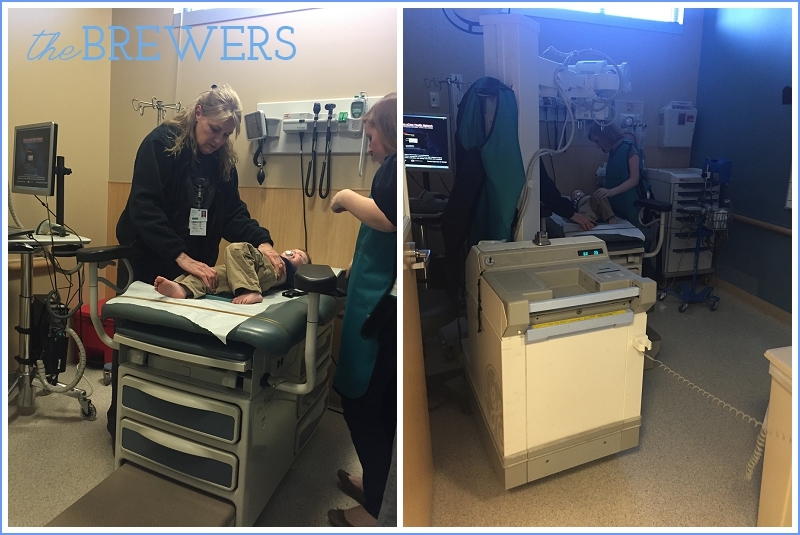 For me, I have seen how concerned Brody gets when I cry, and everything was moving so fast (we had no wait time in the ER between X-rays and being visited by the doctor) that I really didn't have time to. I was also busy on my phone trying to keep so many people updated. Jodi was truly a lifesaver in the ER. 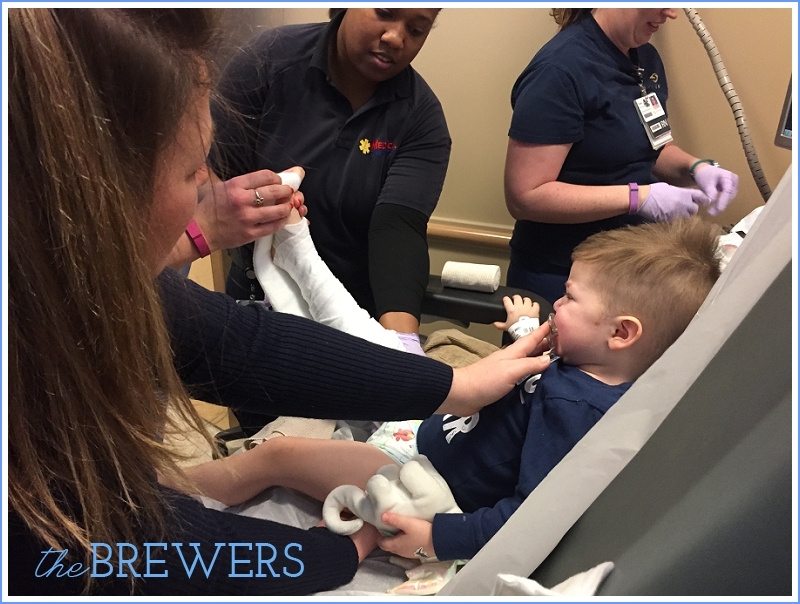 From helping diffuse the situation, hold Brody and just be an extra hand and bit of support. I couldn't have done it without her. Thanks Jode! 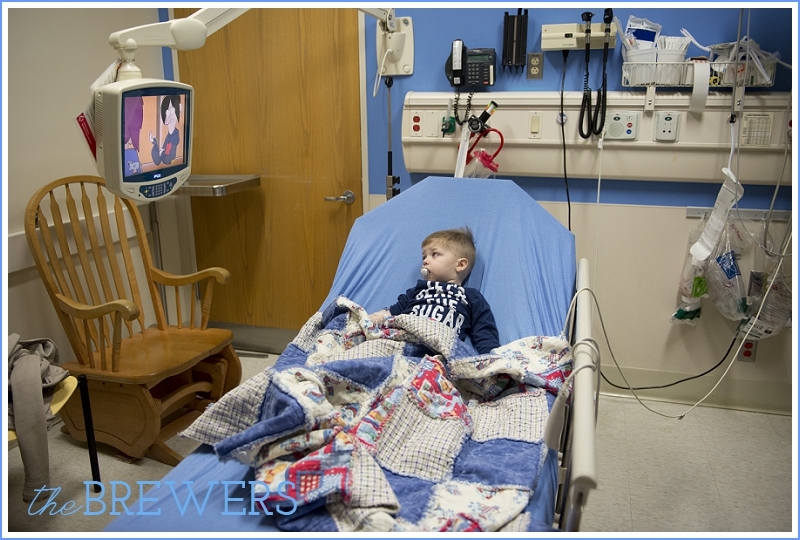 In the pediatric ER at Fairfax, the nurse told us that we were in great hands, especially with our surgeon, as she and the hospital were top of the line. She said "I don't say that just because I've worked here for over 20 years, but I say that because we see what comes in from the other hospitals". 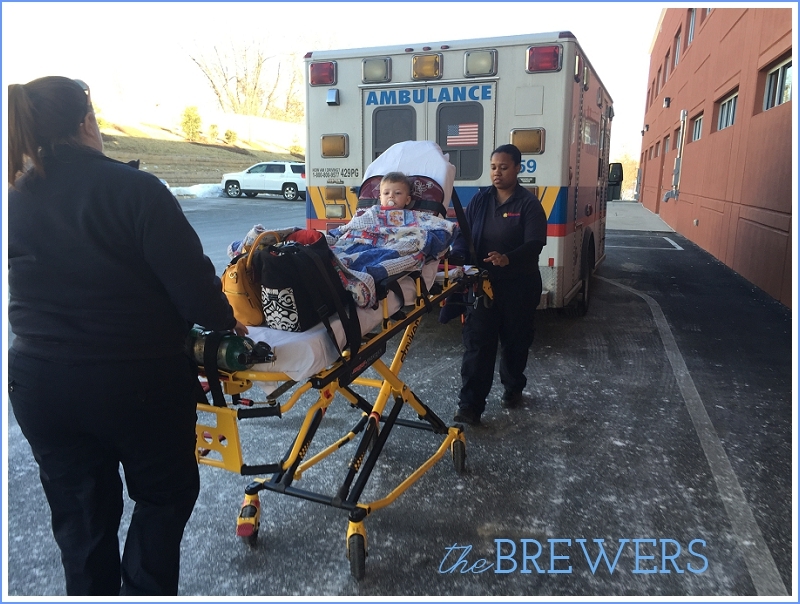 Shortly after we said goodbye to our awesome EMTs, Adam arrived at the hospital. They did their own few checks and seemed to be coordinating everything with Brody's surgeon. A pediatric ER doctor came into check on Brody and told us that more than likely we would avoid slicing and dicing, but Brody would be put into a spica cast. We'd never heard of that, but the description and the google images we'd soon find were quite a shock. As freaky as the cast looked, anything was better than surgery. Shortly after that, a surgical resident told us that we'd hope to get into the OR with a specific doctor around 8PM. 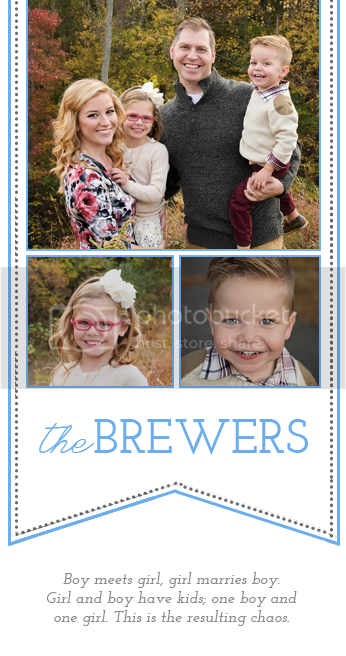 While we were waiting for all the specifics to be done with, my friend that I had contacted earlier told us her husband was free, somewhat nearby and would be able to stop by and give Brody a priesthood blessing. Once we were transferred up to pre-op, we gave our friend our location and he arrived a short time later. As Adam and our friend Craig administered the blessing, Brody folded his arms, closed his eyes, and when they were done, he exclaimed, "Amen!" My sweet boy. Eventually we met with Brody's surgeon (I will refer to her as that, despite the fact he was not cut into) who told us the game plan. I would get to take him back to surgery, so I suited up to do so. 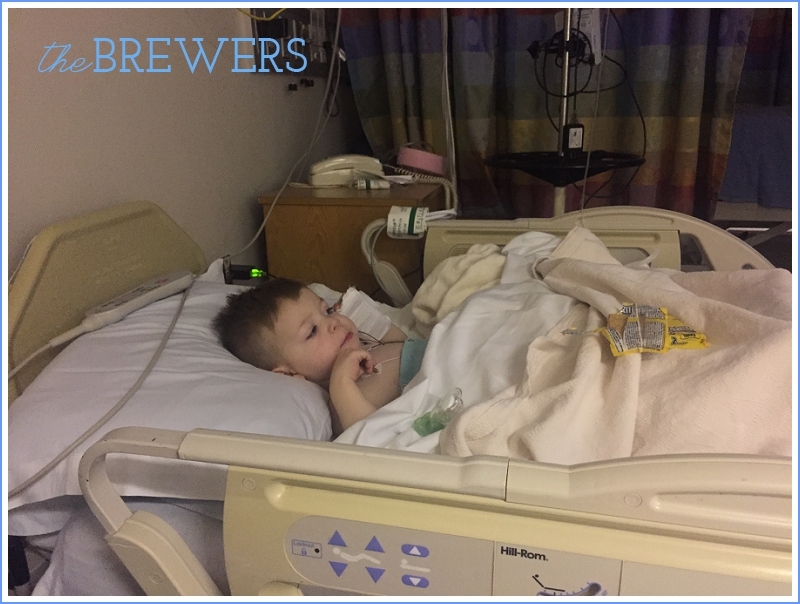 The anesthesiologist asked Adam if he'd like to give Brody a kiss, and Brody pulled out his pluggy and pursed his lips, and made his kissing noise. The anesthesiologist couldn't get over how adorable it was. That's my boy! Even when we got into the OR, Brody was pretty indifferent. Every once in a while he'd look up from my phone for reassurance. Even with the oxygen mask, he didn't move or cry. 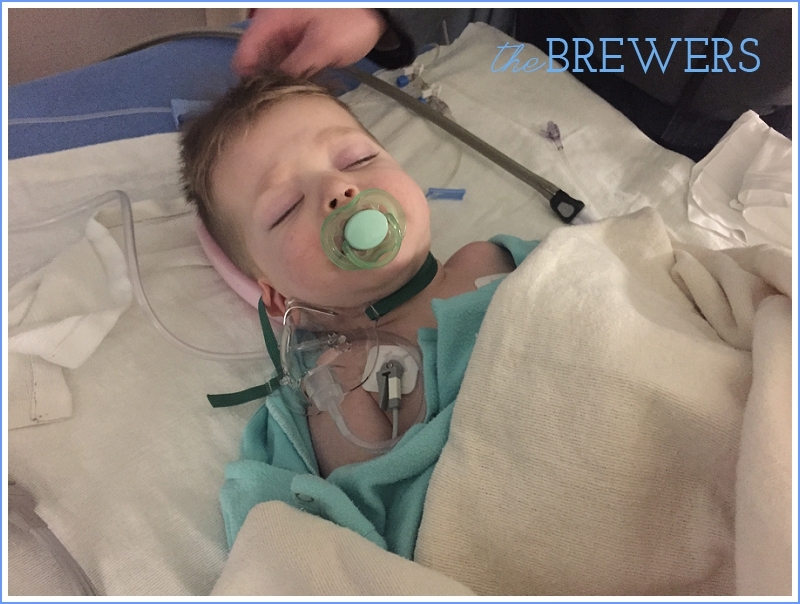 The anesthesiologist had prepped me for everything that would happen, and after he administered the Propofol, Brody immediately fell asleep. They invited me to kiss him goodbye, and once again praised how well I was doing. I am so grateful that I'd had the experience of two surgeries with Autumn, because I was prepared and wasn't scared. I walked back to Adam and our things confident and happy. I believe my whole attitude was a blessing and attributed to the fact that again, I didn't really realize just how serious the situation and injury was. My phone and friends checking in on us was a blessing and a welcome distraction. After a little over an hour, lots of text messages and calls home, the surgeon came out and told us that everything went well. They wanted to keep him over night of course to manage his pain and make sure he was alright, but that he'd be ready for us soon. A nurse came out a few minutes later and we got to go back and see how our little guy was doing and get our first look at what we were in for. Not as bad as some of the variations we had seen online! 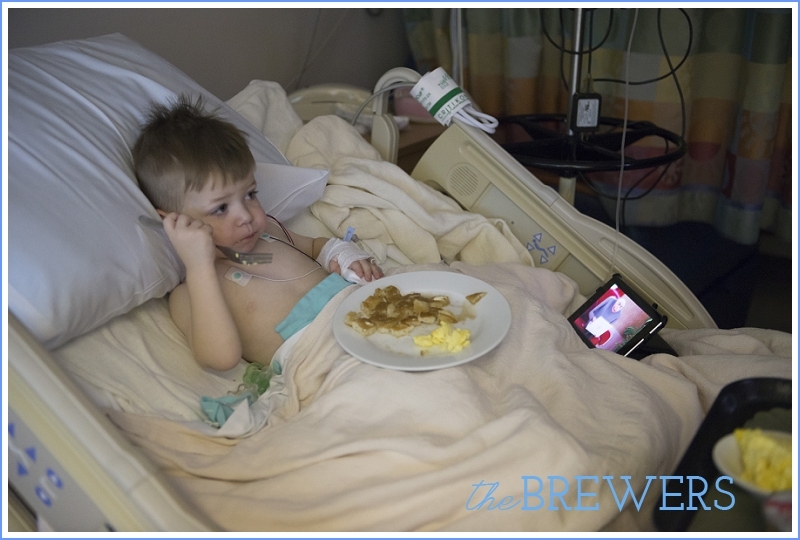 Brody slept for most of his recovery until it was time to move upstairs to the pediatric unit where he and I would stay the night. We got all set up on that floor with our nurses and later said goodnight to Adam. I think it was a tender mercy what I had worn that day - probably my most comfortable stretchy skinny jeans and a comfortable t-shirt. I had a pull out chair that turned into a bed to sleep on and stayed with my little guy call night. He woke up just a few times from pain, and luckily the immediate morphine stream did just the trick. At around 6AM the residents came in and made their rounds, checking in on him and letting us know that we'd be able to go home sometime after lunch. Unfortunately Brody didn't want to go back to sleep much after this, so we turned on some cartoons and ordered "room service" for the two of us. I ordered a potpourri of items since Brody can be a bit fickle. He didn't like the pancakes ("yucky") or the eggs, two of his usual favorites. He did however, eat about 12 graham crackers that I found in the pediatric pantry! We were eager to get home as an ice storm/wintry mix was moving in and we knew the roads wouldn't be great. Adam made it up safely to the hospital, but said things were already a little slippery out there. Moving Brody for the first time was a challenge. He didn't like it at all. The nurse said it was probably more discomfort and fear than pain, as he was pretty doped up on pain medications. Still, it was and is always hard to see him so upset. He just cried and clung to me for dear life and shook each time I changed positions. 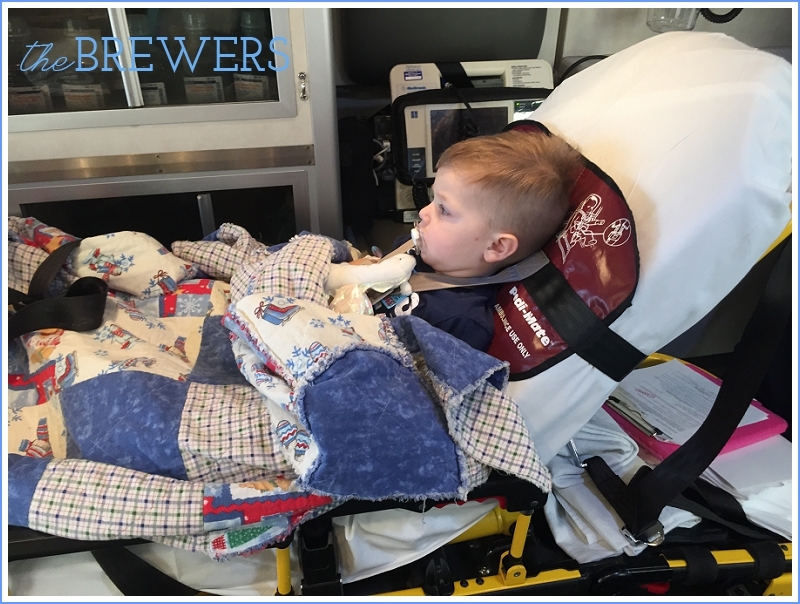 In order to leave the hospital, they needed to see if he would fit into a car seat or a booster. There was a very good chance he wouldn't, as I'd been told by both a nurse and my google research. 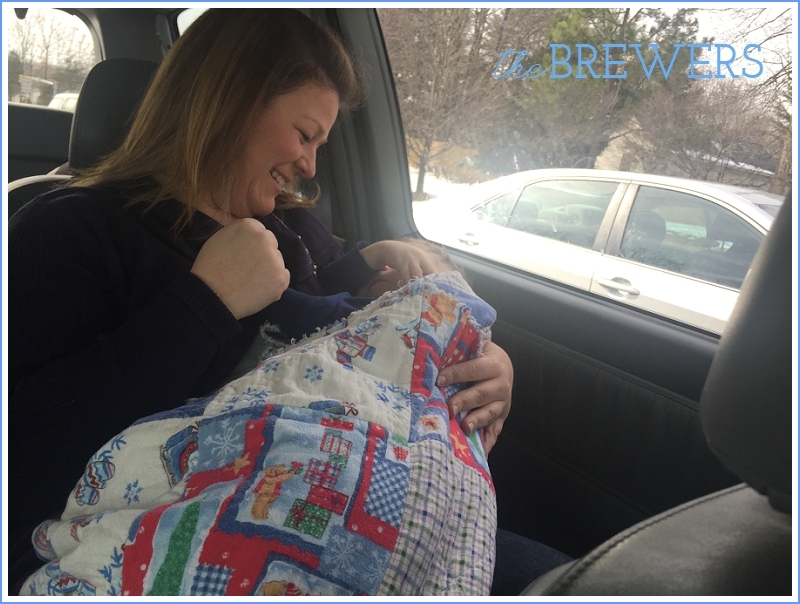 My preference of course was to try his car seat as it is the most safe option, and we were so blessed and excited that he fit! Once that was squared away, we started getting all of our discharge papers and goodies to send home with us from the hospital. We packed up our things and Brody and I got into the wheelchair to go down to the car. Once Adam got everything secured back into the van, we put Brody into the car and made our way back home relatively easily. The roads weren't too bad, and we stuck to major roads as we knew a few back roads home were already closed because of ice and accidents. When we made it home, we began our new "normal". For sometime around 6 weeks Brody will be in his cast. It wasn't until the second day that I began googling a broken femur and seeing what was ahead of us recovery-wise that the gravity of the situation finally hit me and I finally had a good cry. I am so grateful for all of the many messages, texts, and emails of concern and support from our friends. From meals, rides home from the hospital, etc. We're so blessed that this wasn't more serious than it was, and that of all things, it was "only" a broken femur. Wow!! What an experience! Here's to a fast recovery! !